What an eventful day. Molly and I interviewed summer intern applicants. We have so many wonderful applicants. This is the final interview before we make a choice. I wish we could have them all, but because our housing space is limited, we have to chose just three. 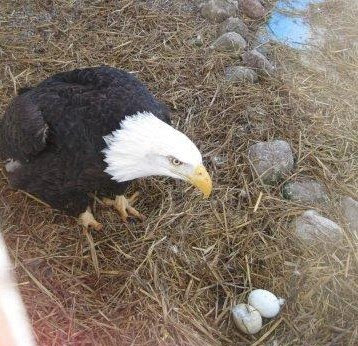 Our static display Bald Eagle, Qushquluk surprised us by laying an egg a few days ago. It is not fertile. We were going to remove the egg and move Qush to her summer enclosure when we noticed she had TWO eggs in the makeshift straw nest. 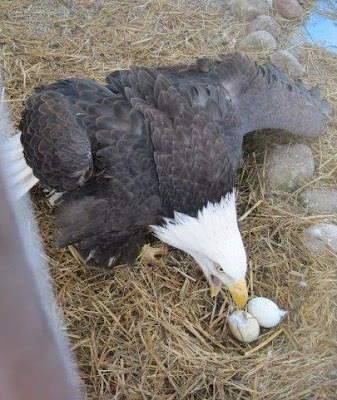 Since it is early spring and tours have not begun for the season, we will let her have peace with the eggs. In about a month she will realize they are not fertile and give them up by herself. Lest you think I am just being "nice" by letting Qush have the eggs for awhile, this is the photo I took after I suggested to her that I was going to take them. Gentle blog readers, if you can read Bald Eagle lips...err beaks, skip the next photo. To say she was clear about what she wanted is an understatement. It is never a good thing to cross any hormonal female, especially one "of a certain age". Qushquluk has been with me for over 20 years but was an older adult when I captured her in Alaska. We were both involved in the Valdez Oil Spill in Alaska in 1989. She was a victim and I was a Bald Eagle researcher studying the effects of the oil spill on Bald Eagles in Prince William Sound. Since we have been together so long, we understand each other. She is not shy about making her wishes known, and I respect them. She does the same for me when I am having a "moment":). We had many patients admitted this weekend. One was a beautiful female Ring-necked Pheasant. Pheasants are not indigenous species. Caring for them in an emergency is a humane choice we make. Some terrific people watched this pheasant at their bird feeder all winter. They were horrified to find she was injured. 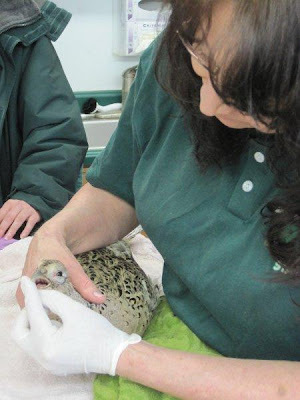 They were able to capture her without incident and a REGI volunteer transported her for care. 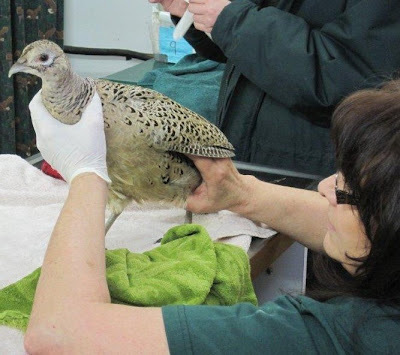 The pheasant has a broken leg and internal bleeding. I am happy to report she is improving. I am confident she will be fine again in a month or so. She has begun to eat on her own. 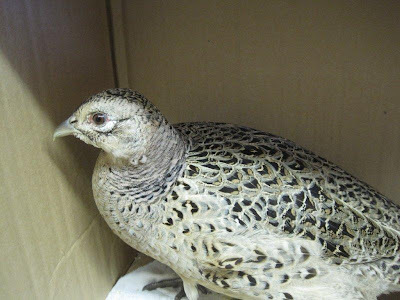 Regular blog readers may recall a male pheasant admitted in December. He is perfect now and we hope these two can be friends as soon as her leg is healed. 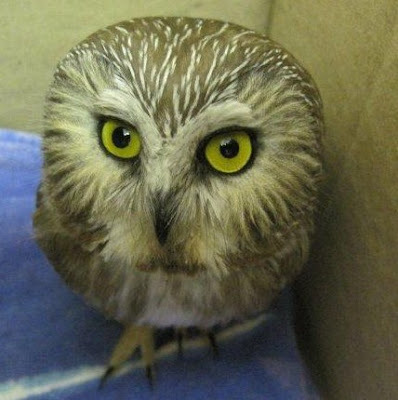 We have great news on the Saw-whet Owl hit by a car near Wausau. His eyes are back to normal. The soft tissue swelling was down by this afternoon. He has begun flying. He ate an entire mouse last night. We are supplementing with oral fluids and emaciation diet to assure he continues doing well. 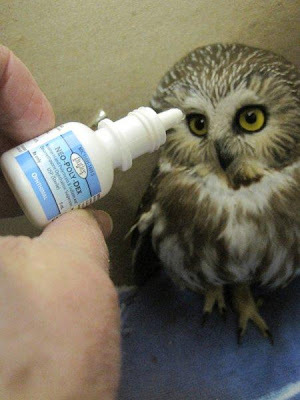 Saw-whet Owls are tiny. He weighs just 80 grams. Missing just one meal has a big impact on them. We have another busy day tomorrow with programs in Wausau and more "de-winterizing". Wow, the little Saw-Whet looks great - your TLC certainly works wonders. He went to an outdoor mew for the afternoon today. He will be in for the night, but he is beginning to get his physical therapy time in with hopes a a release soon.